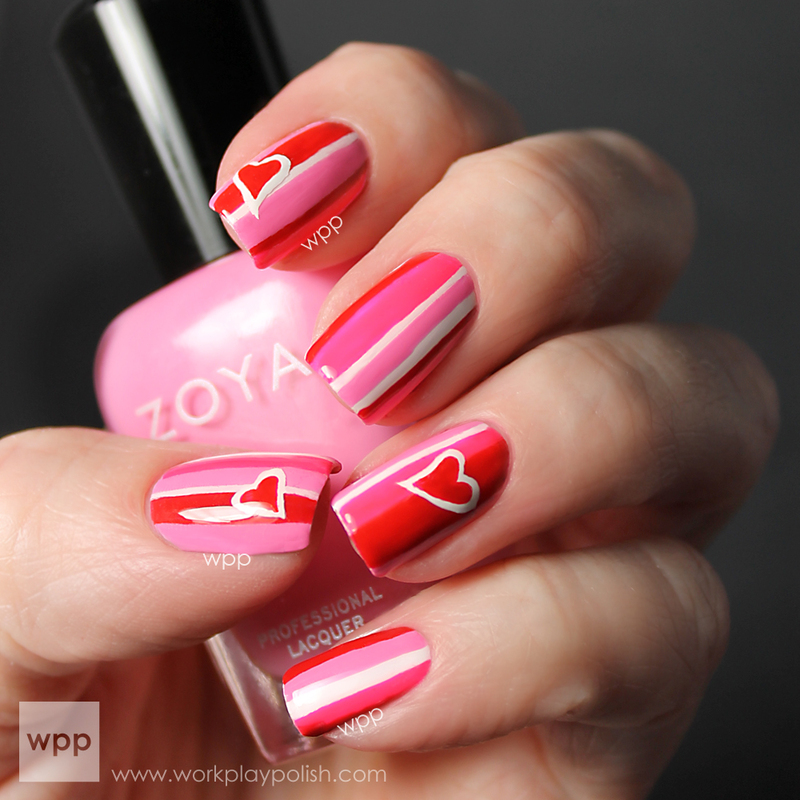 Digit-al Dozen Does Love & Heartbreak: Zoya Valentine's Day Promo!! Happy Valentine's Day!! It's day four of the Digit-al Dozen Love & Heartbreak theme week. I love everything about today's mani! It's just a simple striped pattern but I can't stop looking at it! It's cute and a little funky at the same time. For this look I used three stunning Zoya creams: Ali, Sweet and Carmen. 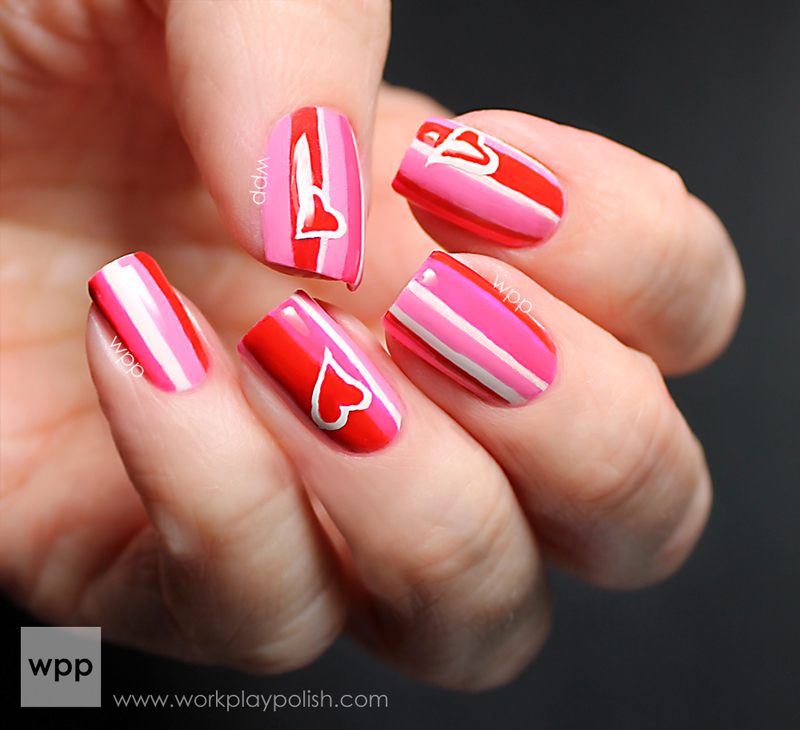 This mani is so easy - anyone can do it. I've included step-by-step instructions and links to full-sized pics at the end of this post. And guess what?! As a Valentine's Day present to you, Zoya is giving away these three polishes FREE with any purchase of $25 or more!! Visit the Zoya blog to get the promo code and details!! Here are the three featured Zoya polishes. (I also used Zoya Purity, a bright white, as the base.) Each color is beautiful on its own...but I especially love them together! Polishing stripes is pretty self explanatory. 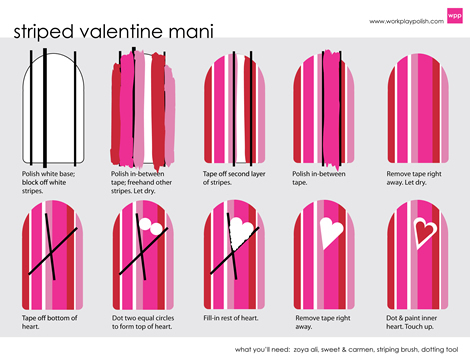 The tutorial below shows you how I got my straight and narrow lines by doing the stripes in layers. Click the graphic to open it. There's no right or wrong order to the colors. The opaqueness of the creams (including Purity) allow you to layer one over the other. In fact, I went back over some nails a third time if I thought they needed more or less of a particular color. And you can always touch up with a nail art brush. Patience is key! I used Zoya Fast Drops and waited a good 10-15 minutes between steps. I finished with two coats of Zoya Armor. So what do you think? I love it! Be sure to take advantage of Zoya Valentine's Day promo from now until 11:59pm EST, 02/27/13 and get Zoya Nail Polish in Carmen, Ali and Sweet FREE* with any purchase of $25 or more! *Visit the Zoya blog to get the promo code and details and shop at zoya.com. You can also find Zoya on Facebook. Don't forget to check out the other Digit-al Dozen Love & Heartbreak masterpieces!